On a recent trip out to Greensburg, PA, home of more vintage toy stores per capita than anywhere else in the world, your friend (and mine) Larry and I stopped at a store selling vintage...well, whatever. Lots of things. It was called the Used Furniture Outlet, but there were hundreds of items on sale from dozens of vendors that didn't have anything to do with furniture. Anyway, as I'm always on the lookout for comics at places like these, I managed to spot and pick up a copy of Action Comics #241 for, I think, $2.50, which, in nearly any condition, is an absolute steal. It's a classic Superman tale about the Fortress of Solitude. I only wish that Joh Gray had felt confident enough in his possessions that he didn't feel the need to write his damn name on the cover. Oh well. I've got something of an affinity for the Silver Age Superman, with his bravado and fatherly wisdom. He's certainly a representation of 1950s America, but Superman of the mid 20th century is often shown to be more inclusive and more progressive than we would probably have any reason to expect of a time filled with more than its share of strife. We start out with Superman, relaxing in his favorite throne/chair, writing in his diary...with his x-ray vision (which, at the time, had the same qualities of his heat vision). This diary consists of eight gigantic pages, each made of what looks to be steel. Presumably, Superman has a room filled with these things, saved for...posterity. We later learn that Superman has a room dedicated to each of his friends, complete with full-size replicas of each of them, which is not the least bit creepy. Here we see that Superman is building a car for Jimmy Olsen. In the event of Superman's death, Jimmy will get...a car made by Superman. Hey, Clark, here's an idea: why not give him the car now, while you're alive? Why hang on to it until you die? Later, Superman decides to paint a scene that he observed while looking at Mars, which apparently includes a Martian being buried alive, or clawing his/her way out of a shallow grave. Rather than just use a regular size brush and take his time, Superman uses a comically huge paintbrush. This is one of his super-hobbies. Superman, as it turns out, has built a robot whose express purpose is to play chess. The robot "plans a million moves at once!" But even though "it's tough beating him! ", Superman goes right ahead and does it anyway, and at super speed to boot. Because that's just how great Superman is. Later on in the story, as Superman tries to figure out just who could have broken in to his Fortress, he comes across his interplanetary zoo. Now, I've always had mixed feelings about the zoo. On one hand, these animals were, as I thought, from doomed civilizations. Superman was saving the last members of entire races, entirely apt for the last son of Krypton. But it always seemed like Superman was neglecting these creatures and that they might be best kept in some other fashion, despite his best intentions. From this story, though, we learn that Superman "could return these creatures to their native worlds" whenever he felt like it...he just, apparently, would rather keep them in arctic cages. What the heck, Superman! Are you just going to worlds and stealing animals?! The following panel, with Clark experiencing night terrors and moments of doubt, is easily the most human (and thus out of place) panel in the whole book. It's a look at the vulnerable Superman that would show up decades later. It's finally revealed at the story's end that Batman himself, with apparently no crime to fight and nothing better to do, had been hiding in the Fortress key to play a prank on Superman. How he got to the middle of the arctic was never explained, but I guess he IS, you know, Batman. Superman gets the last laugh, though, when he fakes a cave-in and convinces Batman that they are both doomed to die a terrible death. What a joker, that Kent. With all of the absurdity going on, I probably took the most pleasure, though, from the final page's flashback scene of Batman - in full costume - going birthday shopping for Superman in a department store. His cape is billowing and everything! Batman also seems to have an eye for comically large props, as he himself (really?) bakes a giant cake, complete with candles that look like both Superman and Clark Kent, providing the Man of Steel with an enormous knife to cut it. We end with this apparent throwaway line from Superman: "I can eat solid steel!" As opposed to hollow steel, I guess. Not that I doubt the man, but this line seems to imply that he has done it, and perhaps with some level of regularity. What a crazy time, 50s-era DC Comics. EDIT: Oh! I figured out what Superman must do with his gigantic, steel diaries after he's done writing in them. He eats them. The issue was filled with a few other fairly forgetful stories (starring Congo Bill and Tommy Tomorrow), but this public service announcement of sorts at the very end caught my attention. It basically says "LOOK AT HUMANS! WE'RE SO GREAT!". I kind of wonder what the point of this was. Great job people. Keep on existing. The fabled Thing sketchbook is back for another round. Let's see what's in stock for this round! Carl is a fellow FUBAR creator and a driving force behind the comic "Pirate Eye" from Action Lab Comics. As he was in attendance at Beyond Comics for our big FUBAR signing, I of course harassed him into adding this great image to the book. 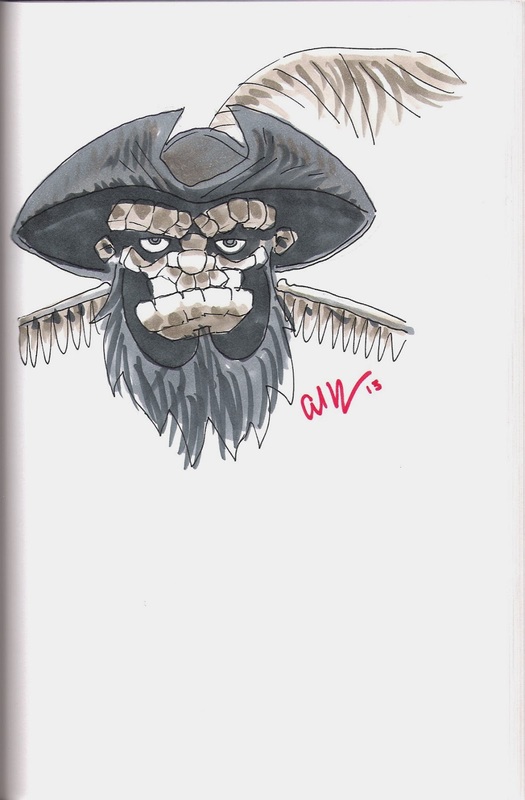 As Carl is the artist on a pirate-themed comic, it seemed only natural that he would draw the Blackbeard Thing from Fantastic Four #5. It's the second of its kind in the book, but it's got a flair all its own. 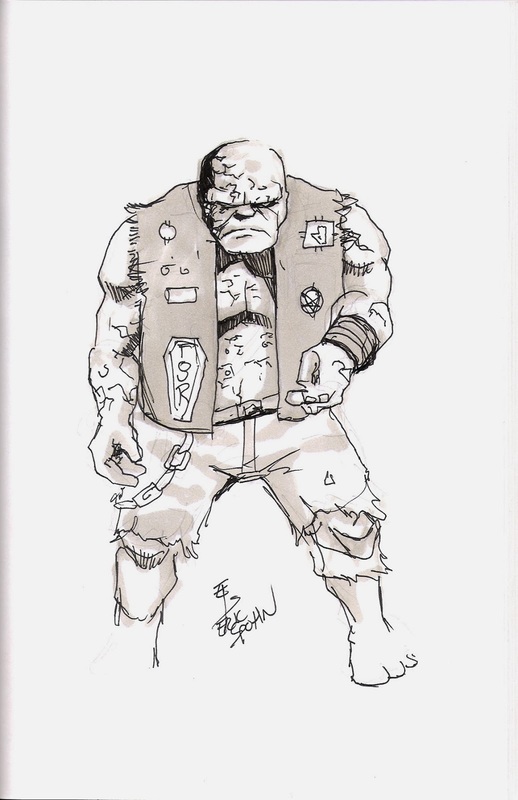 I asked FUBAR artist Eric Spohn to draw in the sketchbook at a criminally late hour, as everyone else was either packing up or out the door, and all he did was draw a full figure rendition of the Thing in his favorite punk rock gear. It's very Frankenstein-esque, moody and dark. Certainly not bad for the last minute. I'm glad Eric was willing to wait around! - because, honestly, who else could I have hogtied into doing something like this? Jeff spent the better part of three days at the Pittsburgh Comicon sketching this out until it was perfect, and man, how awesome it turned out to be. An early warning to Jeff McComsey: the book has an inside back cover, too. And we can see the difference between the two versions. A heck of a bargain, if I can say so. Rusty Gilligan was one of my first collaborators in comics, inking the short story "The Deep" for the book Leesway from Ronin studios, which was...what, my third publication? Something like that. Rusty is a Marvel inker who worked on some classic books and famously worked with Stan Lee on some projects. I got to meet him in person for the first time at the Pittsburgh Comicon, and he was kind enough to draw this classic Thing with a familiar street sign and balloon quote. Getting a sketch from Barry Kitson is a test of endurance. As I learned in 2012, Kitson will graciously provide free sketches for anyone who is brave enough to wait in line for one. He takes loving care with all the work that he does, and that means that sometimes a single sketch will take over an hour (or longer) to complete. Due to the fact that Kitson is not a robot and conventions are not open all night, only a small handful of convention-goers leave with some art from him. It's a fun tradition that requires one to get in line as early as humanly possible. I gave it my best to wait in line for Kitson on the opening Friday of the 2013 Pittsburgh Comicon, but try as I did, I was only fourth in line by the time I got to his booth. Because of this, I waited four and a half hours to land this watercolored sketch, but now that it's over, I can say that it was worth it. Kitson put on a great show and I'm thrilled to have him add another piece and another story to the Thing sketchbook. I bought some production artwork from Kitson's FF run while I waited in line, for a great price. 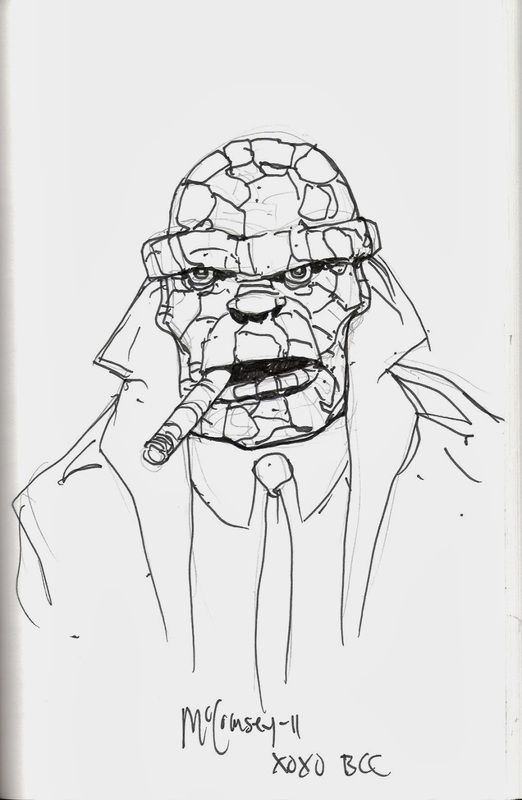 Since he worked on several issues of the title, I asked Kitson to draw the Future Foundation symbol in the corner of the page, to which he obliged, meaning that this is the first sketch of this version of the Thing in the book. It counts, I tell you! If Barry Kitson comes back to the Pittsburgh Comicon for the next go-round...I might just have to get back in line. Okay, that's that for this time. 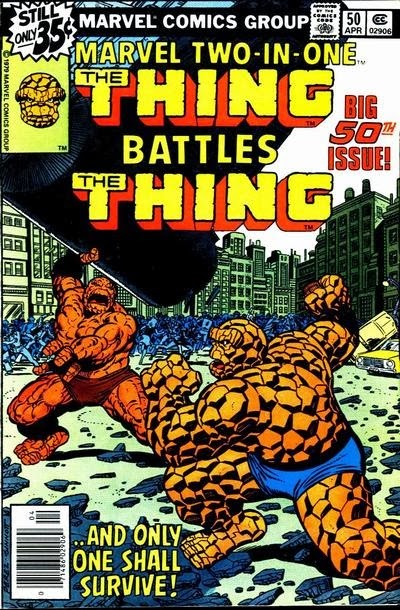 Hope you enjoyed seeing the latest sketches of the Thing! 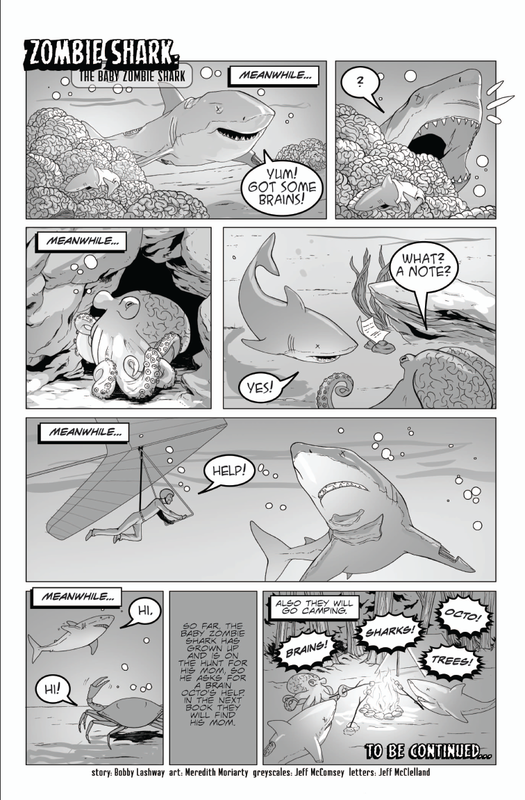 Last year, I posted the finished version of the one-page comic, written by my nephew, titled "Zombie Shark". The premise...is exactly what it sounds like. This year for Christmas, I helped put together the next one-page chapter of the Zombie Shark, titled "The Baby Zombie Shark". It's got that same madcap feel to it that can only be created by someone under 10. So here I present to you the next Zombie Shark, complete with other sea creatures and, for some reason, a guy on a hang glider. The art on this comic was once again provided by the very adept, Pittsburgh area Meredith Moriarty, of whom we should be hearing more from in the next months. 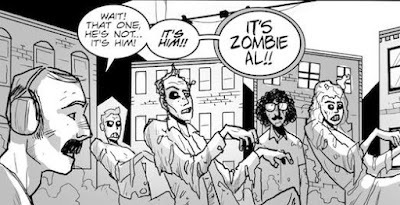 FUBAR's Jeff McComsey graciously provided the greyscales, and this time I lettered the comic myself. I'm pretty happy with how it turned out, though I'm slightly taken aback at just how easy it apparently is to write an entertaining comic strip. 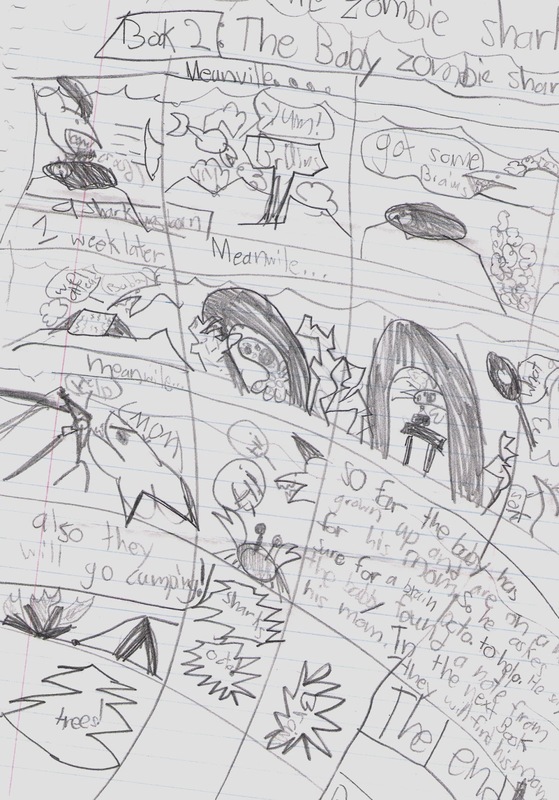 Below you'll find the original layout of this tale, straight from my nephew Bobby. As before, I tried to do my best to capture the feel of the original while presenting it in a professional manner. The kid's got an eye for layout. 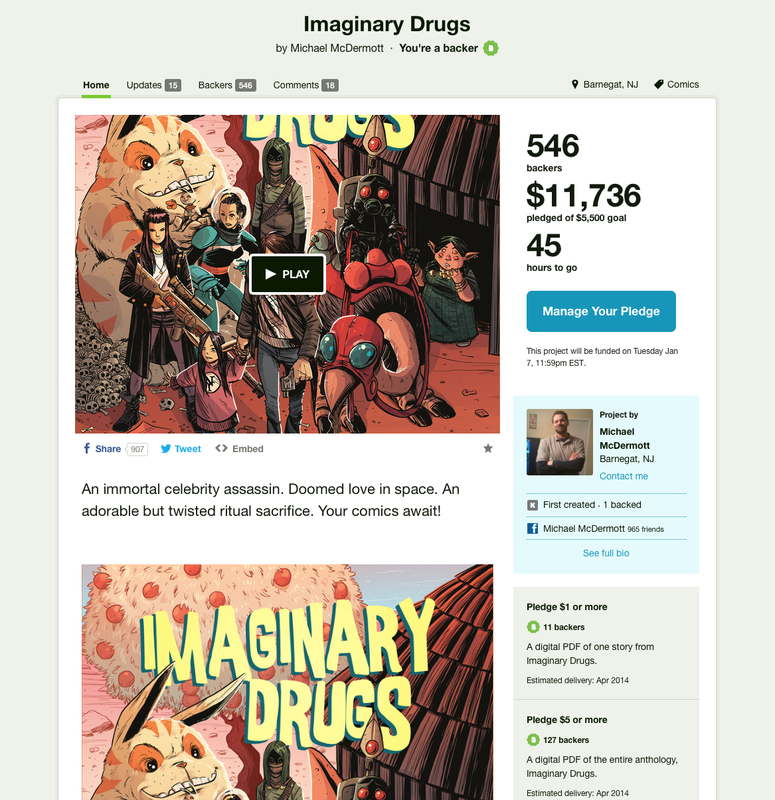 The Imaginary Drugs Kickstarter campaign - coordinated by Michael McDermott and featuring a few stories written by me - has been a success to this point, I think it can be said. With just under two days left before the end, it's raised more than double its initial goal. There's one more stretch goal to go, and at $14,000, I think it's within reach. 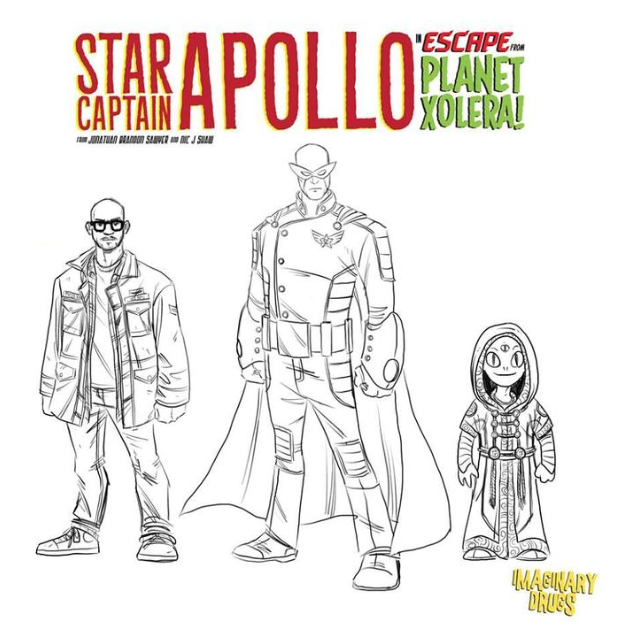 The book has already expanded to include several new stories, such as Star Captain Apollo, as seen below. In the campaign hits its final $14,000 goal, a separate Free Comic Book Day comic will be in the works. If you've donated and helped to make this book a reality, I sincerely appreciate it! We've had over 500 backers to this point. If you're still on the fence, I hope you'll consider it as there are some great comics and other rewards to be had.